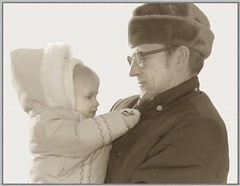 That’s my daughter Lizzi and my father in-law, Hank. The picture was taken at an ice festival twenty-three years ago. Lizzi’s grandpa passed away the year she graduated from high school, it will be seven years this May. Sometimes, when I look at a photo of Hank, I still feel a mixture of anger and sadness that he is gone. The funny thing is, when I first met my husband I wasn’t all that taken with my new father in-law, I thought he was a bit of a grump! But he’s one of those guys that really mellowed as he got older, or maybe it was me who changed. Maybe when you grow to love someone you start to see them differently, maybe love allows us to see past the rough edges that life’s lessons have left behind, allowing us to see the into heart and soul of our loved one. When I was working on one of my books a few years ago, I had an Aha! moment. I was struggling to understand intolerance and wondering if it was really possible to be blind to the physical differences in people. I was at a store shopping when I suddenly could see the spirits of the people walking by, it was like a door had opened and the physical aspect of their person somehow dissolved leaving behind a kind of dancing, colored light. I know it sounds strange, and it was, but it was also an amazing thing to see (and no, I hadn’t been drinking or smoking any illegal substances!). It only lasted a few moments, but for those few moments I felt such an affection for those imperfect, yet beautiful souls, and I was thankful for having been given such a gift. I believe it was the answer to my question, and the answer was a resounding yes, it is possible to look beyond our differences if we choose to look at one another through the eyes of love. This entry was posted in family, my life, photos and tagged family, my life, photos by Lilli Day aka bookbabie. Bookmark the permalink.